William T. Trego | Catalogue Raisonné | William Trego in his studio with "The Rescue of the Colors"
Shortly after finishing his masterpiece, "The Rescue of the Colors," and before it was sent to Philadelphia for framing, Trego arranged to have this photograph taken of him and the painting in his studio. Several autographed copies of this photo were given to family and friends as souvenirs. The completion of this ambitious work was a proud moment for the artist, who hoped to tour the painting and thus revitalize his career. 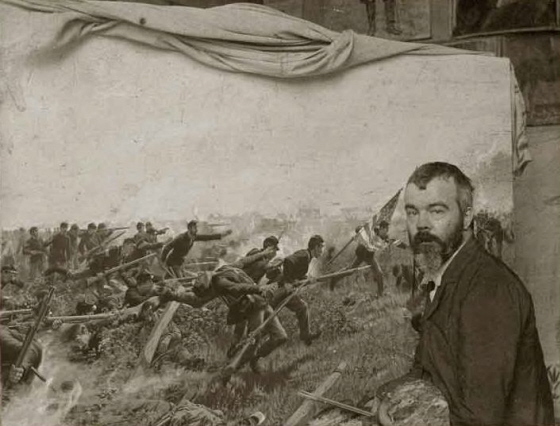 Just above the painting, on the wall of the studio, can be seen the legs of the union officer portrayed in the charcoal sketch, "The Melancholy Union Soldier."